The day started off with the semi finals draw, which saw Horspath drawn against Aston Rowant, and Hook Norton drawn against Challow. The semi final between Challow and Hook Norton was a thrilling match, as Challow bowled Hook Norton out for 90. In reply Challow got off to a good start at 36-0, however a middle order collapse saw them reach 74-8 at one point. The Challow batsman then held their nerve to secure a two wicket win and progress to the final. The semi final between Aston Rowant and Horspath, saw Horspath be put into bat first. The hosts got off to a good start, with opener Alfie Turner leading the way. Horspath went on to post just over 160. In reply Rowant got off to a steady start, a middle order collapse then saw Rowant being bowled out for just over one hundred. In the final, Horspath won the toss and elected to field. Challow got of to a flyer with the bat, as they were 42-0 off 4 overs at one point. The loss of three quick wickets saw their run rate drop slightly. Challow went on to end up reaching 145-9 off their 20 overs. In reply Horspath lost some early wickets to leave them on 23-3. 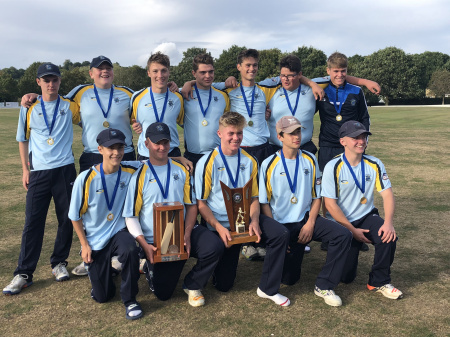 Alfie Turner attempted to rebuild the home sides innings but his dismissal saw Horspath lose further wickets as they reached 104 all out, with Will Humphreys taking 3-8 in his opening spell. The day concluded with the presentation ceremony which saw Chris Clements and the Honey family present the medals, and trophies. A special thank you must go to Horspath for hosting the finals day, and for being such great hosts. We would also like to thank all teams that participated this season, and we hope to see you all again next year.